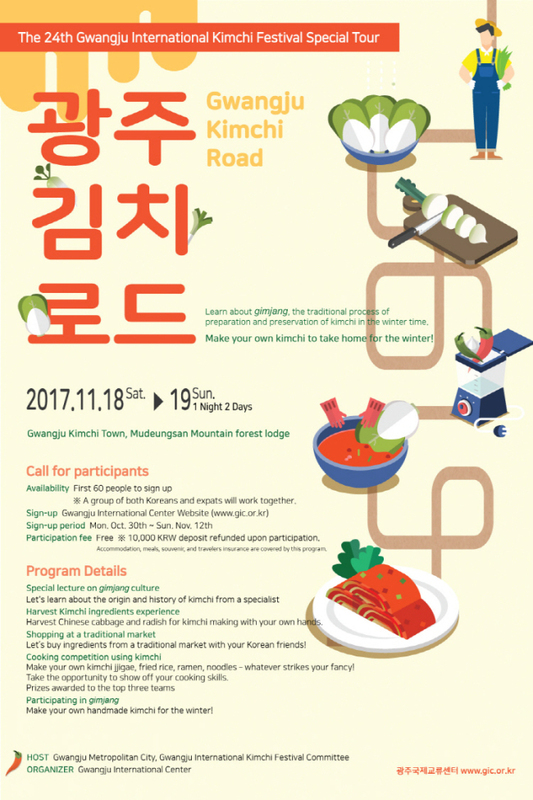 Gwangju International Center will run its Kimchi Road program on Nov. 18-19. Held as part of the Gwangju International Kimchi Festival, the two-day tour visits a forest lodge in Mudeungsan, where guests will get an introduction to kimchi and hands-on instruction at making kimchi themselves. The program includes shopping for ingredients and harvesting them from fields as well as making kimchi and a cookery competition using kimchi as an ingredient. Participation is 10,000 won. Registration is open to 60 people and can be made via gic.or.kr, where more information is also available.